The five decision making steps presented here can be used in an individual or group decision making process. The first of the decision making steps is to assess the situation, determine the issues and set objectives. Define the need/problem, its symptoms and possible causes. "Detective" approach is the best way to explore information and understand the situation. Analyze by asking the six helpers: what why, who, when, how, where?. Once you have collected all the sufficient information, present the situation to your team. Generate and analyze all the potential alternatives. The generation of ideas in itself is a very creative process and the best approach to do it is to involve as many stakeholders as possible. Encourage them to list down and examine all the prospects. 3. Define criteria: Compare each alternative against each: eg. time (short and long-term), social dynamics and impact on the organization, risk assessment, feasibility etc. By identifying pro-s and con-s of each alternative, you will be able to narrow them down and select the ones the best fit the current situation and priorities. This process also helps to analyze the consequences of each chosen alternative, assessing the risk as well as their benefits and identifying who wins and who loses. The "making" of a decision should not be an isolated activity but a natural outcome of the above process. 4. Design an implementation plan. Design a strategy that can be used for implementing the selected alternative. A plan of action requires specific steps to implementing the alternative, including objectives, timeline, methods and resources. 5. Build feed-back systems. Develop a monitoring procedure and indicators to measure the impact of the selected alternative.Follow-up and check if you met the objectives and make necessary changes by measuring progress. Decision Making Steps - Considerations: If you are using the above decision making steps in a group setting, the way the process is facilitated makes a big difference in the quality of the generated alternatives and the made decision. By involving as many stakeholders as possible you are not only getting more ideas and solutions, but also improving group dynamics and motivating people. Shared decisions provide ownership to everyone engaged in the process making the implementation stage more joyous and meaningful.So take the time to do it right, explore new perspectives with the group, build a shared foundation of understanding, strive for decisions that provide inclusive solutions that will benefit everyone who holds a stake in the outcome. Help your group focus simultaneously on the same thing with structured thinking activities as brainstorming. When using brainstorming consider that every contribution is worthwhile, suspend judgment and become a facilitator. Use visual and participatory tools as flow charts, decision matrix etc. Flowcharts are used to give sequences of events as well as show cause and effect. Start with the issue that requires a decision and with the group identify to or more suggested alternatives. 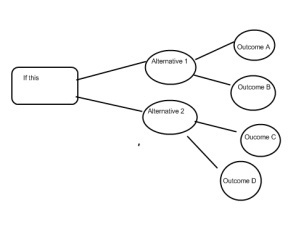 Analyze each alternative and different outcomes. Compare outcomes and and make a decision. Flowcharts help visualize the process and engage everyone in contributing.